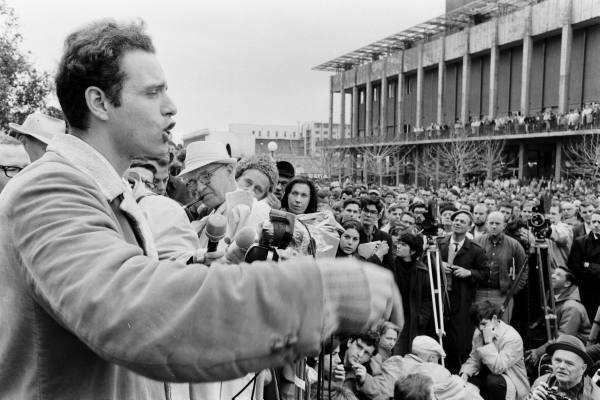 San Francisco-based journalist Seth Rosenfeld has just released a book that details how deep and invasive the FBI's involvement was in the student protests that rocked UC-Berkley in the 1960s. Titled Subversives: The FBIs War on Student Radicals and Reagan's Rise to Power, the book is the result of 31-years of reporting that began when Rosenfeld was a writer at the Daily Californian, Berkley's student newspaper. In a recent Fresh Air interview, Rosenfeld explains the book's genesis. I first got interested in the subject when I was a student at the University of California at Berkley in the late 70s. I was a writer for the Daily Californian student newspaper. The Daily Cal had requested some FBI files on Berkley under the freedom of information act. So I looked at those files and I wrote a story about the FBI spying on the Free Speech Movement and on the Vietnam Day committee and they were published back in 1982, but I realized there was far more to the FBI's activities on campus. So I submitted a much larger freedom of information act request. I figured I would get the files in a year or so, write the story and go onto the next project. I had no idea that I was embarking on what would become a 31 year legal odyssey. The project would take him through five different court cases and $600,000 in legal fees, something Rosenfeld never could have anticipated when he was a 25-year old student journalist. Rosenfeld's reporting not only revealed that the Hoover's bureau was a partisan force that ruined the lives on students and administrators, including the university president, who they believed to be politically suspect, but that future President Ronald Reagan was heavily involved in these activities and benefitted personally because of his relationship to the FBI. Here's a few quotes from two stories from the Daily Californian from a decade ago in which Rosenfeld talks about his time at the student paper. "I did some stories when I was with The Daily Cal about some FBI files, and I realize there must be more there. So I submitted a much larger (Freedom of Information Act) request," Rosenfeld says. "I'm glad to be getting the information out to the public. I had no idea it would take this long." "I did write some stories of the FBI on campus," Rosenfeld says. "That's how I first got interested in it, and then it became a class project at the journalism school. I was very curious about this history at Berkeley and wanted to know what the government was up to, so I filed this (Freedom of Information Act) request. I think it shed light on a turbulent historic period of time." Seth Rosenfeld was a 25-year-old UC Berkeley journalism student and Daily Californian reporter when, in 1981, his editor first handed him several thousand pages of FBI documents to sift through. What he found in those files would pitch him headlong into an epic legal battle that would cost the FBI more than $1 million and eventually reveal the agency's covert attempts to thwart Berkeley's Free Speech Movement and topple then-UC President Clark Kerr. "I had no idea when I came over to the Daily Cal's office that day in 1981 that I was embarking on a 20-year odyssey," says Rosenfeld, who will be honored for his reporting today as the Daily Cal Alumni of the Year. The stories from those original documents filled more than 20 pages of the Daily Cal the next year, detailing how, during the 1960s and '70s, the FBI investigated UC Berkeley faculty and student protesters, as well as their families.But many of the documents had large chunks blacked out. Others pointed toward larger plots, involving President Kerr himself, particularly one note handwritten in FBI Director J. Edgar Hoover's jagged scrawl: "I know Kerr is no good." "It was all this incredible history," Rosenfeld says. "Not only of the protests, but what the government was doing-a secret history. The more I read, the more interested I got." So Rosenfeld began submitting more, broader requests under the Freedom of Information Act for "any and all" FBI files on the people, events and organizations that colored Berkeley during the Cold War era. "Whenever you have the combination of secrecy and power, you have the potential for abuse," he says. "The press has a special duty to shed light on those areas." The most seemingly untouchable organizations must still answer for their actions, Rosenfeld says. "Even a college newspaper can hold the most powerful government agencies accountable," he says.